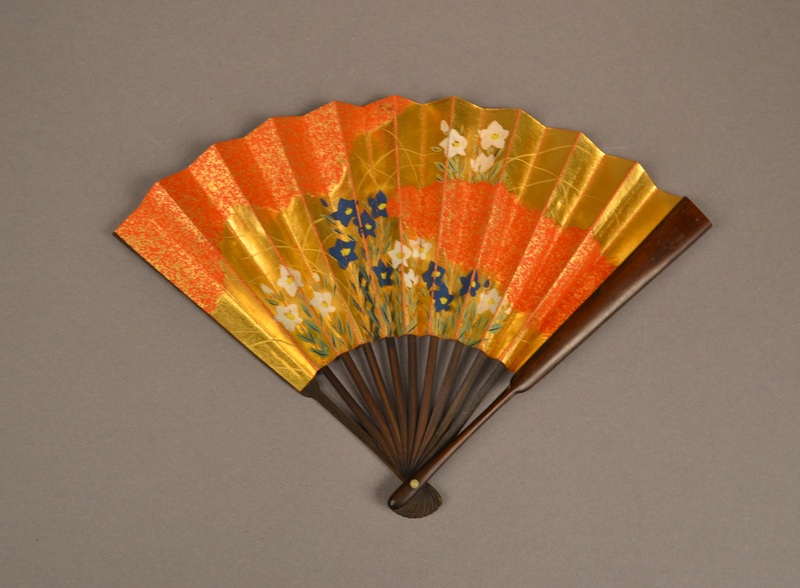 This sensu, or accordion-style folding fan, is one of the Miss Kyoto doll accessories. 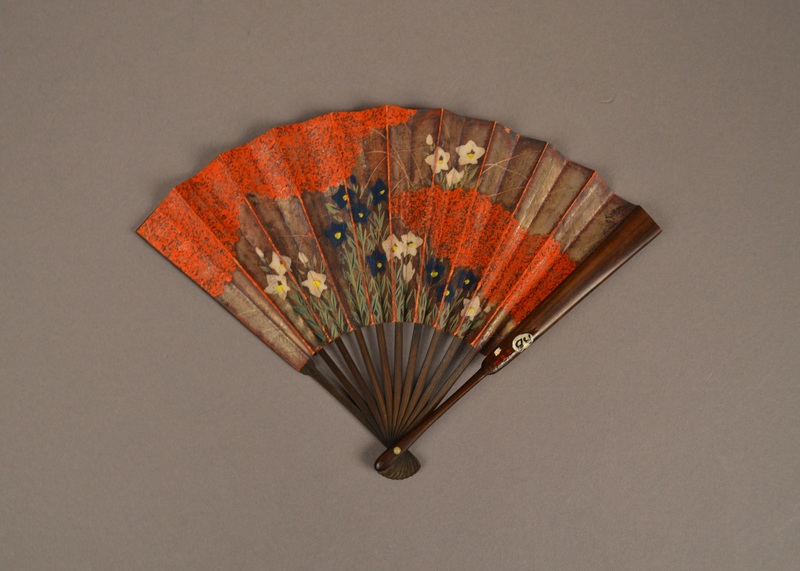 The miniature fan has wooden ribbing and a paper mount, painted with a scene of blue and white irises against a flowing gold and orange background. The painting is likely an allusion to the Yatsuhashi (literally "eight-planked bridge"), a popular artistic and poetric trope deriving from The Tale of Ise, a 10th-century literary classic. The most famous version of the Yatsuhashi is Ogata Korin's Yatsuhashi byōbu (folding screens) from the late 17th/early 18th century. 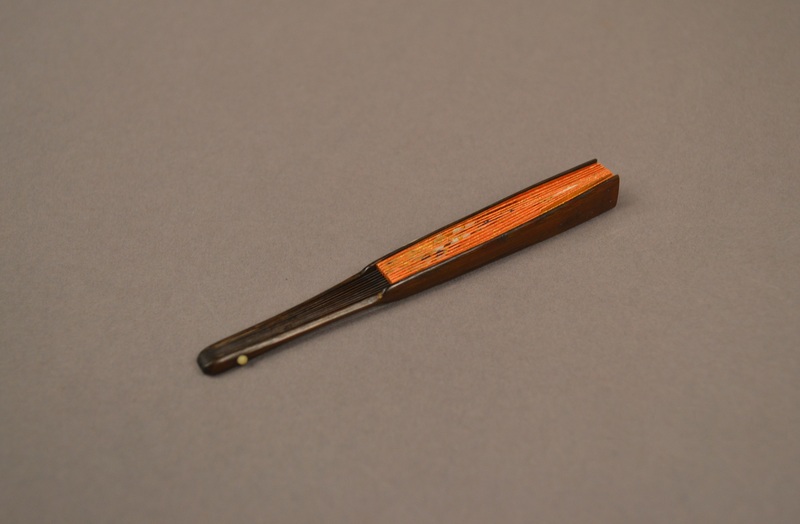 The Yatsuhashi scene from The Tale of Ise is one in which a traveling aristocrat stops to ponder a growth of irises by a bridge and composes a poem of longing and wistfulness for those he has left behind on his journey. Each of the five lines of the poem begins with one syllable from the Japanese word for iris (hanashōbu), which cemented the association of the iris with that specific place; an artistic rendering of irises in front of a bridge is frequently a reference to that famous scene as well. The poem is translated as follows: "I have a beloved wife/Familiar as the skirt/Of a well-worn robe/And so this distant journeying/Fills my heart with grief" (Source: Heilbrunn Timeline of Art History).